Captain Bernard Warner has been at sea for forty years and in command for the past twelve years. He was born near Leeds and grew up in the North Yorkshire town of Wetherby. A lifetime friendship with the sea was cultivated at Sandsend near Whitby on the north east coast of England, where he spent the summer holidays sailing and fishing with his father. When just eight years old he went away to boarding school and was educated initially at Terrington Hall near York (1956 - 1961) and then at Denstone College in Staffordshire (1961 - 1964). At sixteen he entered the Warsash School of Navigation at the University of Southampton. Queen Mary and Queen Elizabeth would frequently sail past the college as they made their way up Southampton Water into the port and it was these ships which gave him the inspiration to one day command a Cunard Trans Atlantic liner. In 1965 Cunard Line would only consider employing navigating officers who had attained a Master's Certificate. Captain Warner would be twenty five years old by the time this had been achieved. The alternative was to join P&O, which was the other great passenger shipping company of the day. He signed indentures and commenced a four year cadetship with them on 1st January 1966. P&O had a large passenger fleet but an even larger fleet of cargo ships. His first voyage was from King George V dock in London to the Far East aboard Somali, a 7000 gross ton freighter. 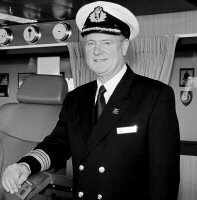 Nearing the end of his cadetship in 1969, he joined his first passenger ship Oriana, and by the early seventies he was sailing as a Junior Deck Officer aboard the P&O ship Iberia. He was later to be appointed to the legendary P&O liner Canberra, where he also sailed as Deputy Captain in 1988. Captain Warner met his wife, Tina, on board Royal Princess. They were married in 1988 and now live in Leek Wootton (about one mile from Warwick Castle). Their two sons, Tom (aged 16) and Charles (aged 11), enjoy sailing aboard with them during school holidays. In 1994, he was appointed to his first command - the 20000 gross ton ship Island Princess - and since that time has commanded seven other passenger ships. He oversaw the building of Dawn Princess, Golden Princess and Diamond Princess and was designated the first Master of both Golden Princess and Diamond Princess, which at 116 000 gross tons, are slightly smaller than Queen Mary 2 (151,400 gross tons) On November 11th 1996 he was invited by the British & Commonwealth Office to lay a wreath at the Cenotaph on behalf of the British Merchant Navy. This is an annual event to honour all those who have given their lives in both World Wars. In 1998 he was elected a Younger Brother of Trinity House whose Master is the Duke of Edinburgh, and who have recently asked Princess Anne to be its first female member. Bernard Warner is a descendant of Sir Thomas Warner who, in the 17th Century, was Captain of the schooner Marmaduke. Sir Thomas crossed the Atlantic in 1623, and founded the first English settlement in the West Indies at the island of St Christopher (now known as St Kitts). He claimed it on behalf of King James 1st of England and in 1625 became the island's first Governor General. His tomb is at St. Thomas church in Middle Island village on St Kitts. Captain Warner has recently realised one of his career ambitions after being appointed to command the majestic Queen Mary 2.